And Moses finished setting up the Tent of Meeting. …no place on earth is devoid of the Shechinah. Rabbi Joshua of Sikhnin said in the name of Rabbi Levi, What is the Tabernacle compared with? With a cave situated on the edge of the sea. 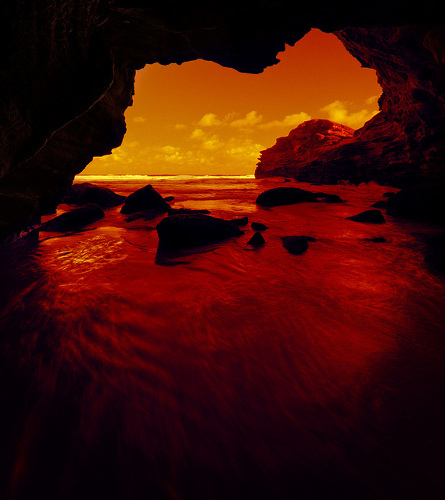 When the sea rises and floods it, the cave is filled by the sea, yet the sea is not diminished. Likewise, the Tabernacle was filled with the radiance of the Shechinah. If you haven’t done so already, please read Part 1 of this “meditation” before continuing here. This is a continuation of my commentary on the teaching “For God’s Dwelling Place” presented at the First Fruits of Zion Shavuot conference at Beth Immanuel Sabbath Fellowship by Rabbi Carl Kinbar. But to borrow a little “rabbinic language,” to what can the dwelling place of God be compared? Now Moses was faithful in all God’s house as a servant, to testify to the things that would be spoken later. Christ, however, was faithful over God’s house as a son, and we are his house if we hold firm the confidence and the pride that belong to hope. The end of the Book of Exodus records Moses finishing the work of setting up the Tabernacle and then the Divine Presence covering and filling the Mishkan. Moses was faithful in the construction of a dwelling place for God among His people Israel as God’s servant. But there is one who is more than a servant. He is a son. How much more faithful is the son over the house of the father than the servant? Come to him, a living stone, though rejected by mortals yet chosen and precious in God’s sight, and like living stones, let yourselves be built into a spiritual house, to be a holy priesthood, to offer spiritual sacrifices acceptable to God through Jesus Christ. Reading Hebrews and Peter’s first letter gives the impression of an “either-or” situation. Either God dwells in a Temple of stone or He dwells in a Temple of flesh and blood, with a flesh and blood Son being the cornerstone of the “structure.” But is this necessarily true in a permanent sense? It is true that there is no Temple in Jerusalem today, and it is true that the Spirit dwells within each of God’s people, that we come together as “living stones” and united, we form a “Temple” of God, the body of Messiah. And it is true that today we offer spiritual sacrifices to God through Messiah. The sacrifices God desires are a broken spirit; a heart broken and humbled, O God, You will not despise. Not too long ago, I wrote about what it is to be broken in heart and in spirit before God and among other heartbroken people. These were the sacrifices we offered to God at Shavuot and His Spirit filled the synagogue in Hudson, Wisconsin during the days of the festival. There is no Temple sacrifice that atones for murder and adultery, both of which David was guilty of, except on Yom Kippur. He must have known this when he wrote his famous Psalm. But what is the state of the heart of one who approaches God in abject humility on Yom Kippur? Is not every Jew heartbroken, contrite, and humbled? Are these not the sacrifices we make to God with our lives as we turn away from our sins and turn to Him begging for forgiveness? Rescue me from blood-guilt, O God, God of my salvation, let my tongue sing joyously of Your righteousness. O Lord, open my lips that my mouth may declare Your praise. David seems to paint a portrait that is completely appropriate for the disciple of Jesus in the world today. No stone Temple is required when we turn to God and offer spiritual sacrifices of the heart. But then, David says something that doesn’t fit into the Christian template. Then You will desire the offerings of righteousness, burnt-offering, and whole offering; then will bulls go up upon Your altar. And yet we know that there will be a physical Temple in Jerusalem again, and we know that each of the nations who went up against (who will go up against) Jerusalem in the final days, will be commanded to send representatives to Jerusalem for Sukkot each year (Zechariah 14:16). True celebration of Sukkot in the days when there is a Temple in Jerusalem require that sacrifices be made in the Temple (Leviticus 23:33-43). In the days of the Temple, will the sacrifices of the heart no longer be required? Hardly. Read Psalm 51 again. Once our hearts and spirits are broken before God as spiritual sacrifices, then will the offerings of bulls be accepted upon the Temple altar. And God will once again dwell among His nation Israel and in the hearts of His devout ones, first the Jew and also the Gentile who is called by His Name. But let’s take a closer look at what’s happening now. So he came and proclaimed peace to you who were far off and peace to those who were near; for through him both of us have access in one Spirit to the Father. So then you are no longer strangers and aliens, but you are citizens with the saints and also members of the household of God, built upon the foundation of the apostles and prophets, with Christ Jesus himself as the cornerstone. In him the whole structure is joined together and grows into a holy temple in the Lord; in whom you also are built together spiritually into a dwelling place for God. Gentiles are brought near to Israel, bringing us inside the house, but we also join Israel in the process of building the house of God with Messiah as the cornerstone. Jewish and Gentile disciples of the Master are all part of a single household; a holy Temple of God. Jesus is the house and the house is also in him. Jesus is pre-eminent and pre-dominant in the house. For we are God’s servants, working together; you are God’s field, God’s building. According to the grace of God given to me, like a skilled master builder I laid a foundation, and someone else is building on it. Each builder must choose with care how to build on it. However, Rabbi Kinbar suggests that we should be careful what materials we use to lay upon the foundation stones of the house. A quick look at the condition of “the church” today, at least in the United States, suggests that many Christians aren’t using the finest materials for the construction job. In fact, sad to say, many churches are using sub-standard materials, flimsy and faulty wood, stone, and tools. Precious stones were used in the construction of the Jerusalem Temple. Should we use anything less in the Temple where we are the stones? Those who speak in a tongue build up themselves, but those who prophesy build up the church…So with yourselves; since you are eager for spiritual gifts, strive to excel in them for building up the church…What should be done then, my friends? When you come together, each one has a hymn, a lesson, a revelation, a tongue, or an interpretation. Let all things be done for building up. These are all images of building up the house of God as members of the house, the body, the community of faith. We build with our spiritual gifts, we build with prayer, with hope, with love, with faith. 1 Corinthians 12:11 says that we are all one by the same Spirit but each one of us individually has specific gifts. We’re not all alike. 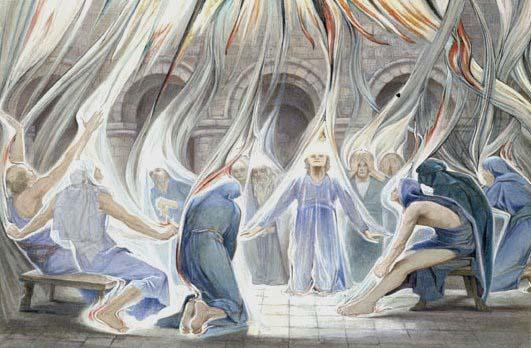 We each have something unique to contribute, just as Bezalel and Oholiab and “every skillful one to whom the Lord had given skill” had unique talents they used in making the elements of the Tabernacle (Exodus 36:1-3). I’ve said previously that we are a work in progress as a body of faith. God has not yet written his Torah on our hearts, nor have our hearts been fully transformed from stone to blood-pumping hot flesh. We still cry out to one another, “Know God!” (see Jeremiah 31; Hebrews 8; 10). Rabbi Kinbar finished his presentation by stating something I consider remarkable about our “living house.” God is actually living in the dwelling place we are constructing while it is still in the process of being built. This is completely unlike His dwelling in the Tabernacle and later, the Temple, because those projects had to be fully completed before the Divine Presence filled them. For He lives within us as we are still measuring and hammering and raising wooden beams and laying precious foundation stones. The plans for the Tabernacle and the Temple were exquisitely precise and each and every piece of stone and wood was of the finest quality, constructed by exceptionally skilled craftsmen. Not so God’s living house today. We stumble half blind to draw and redraw the blueprints, reach for any tool handy, and much of the time, employ shoddy workmanship and poor materials in our efforts. And yet God is tolerant of us and what we’re doing. He continues to live among us and to live in us as we build and rebuild ourselves as believers, striving forward, falling back, but never taking our gaze from the soul of our Master. The dwelling place of God is past, present and future all at once. Just imagine when the house if finally complete, when the imperfections have been burned away like dross, leaving only a precious and perfect product. When that day comes, then our King will be evident in the house, and he will be one and His Name one. 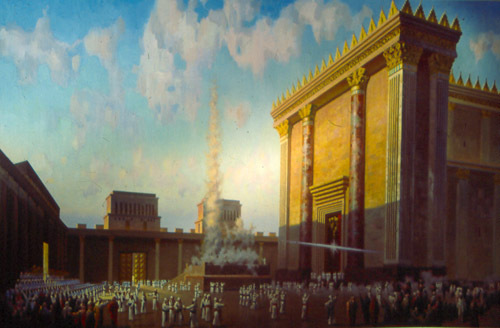 And God will dwell within us as the Presence dwells in the Jerusalem Temple. And Messiah will walk among His people again. But He’s also in His house now, and we are here too, united in His Spirit as His Spirit unites us.